Thanks to Camp is an initiative of the Canadian Camping Association aiming to promote the positive impact camp has on the lives of millions across the country. They put together a way to show that camp is more than just fun; it actually helps children grow, and gives them all kinds of tools to succeed in life. More Than Just Fun was launched to let families learn about the joys and benefits of camp. 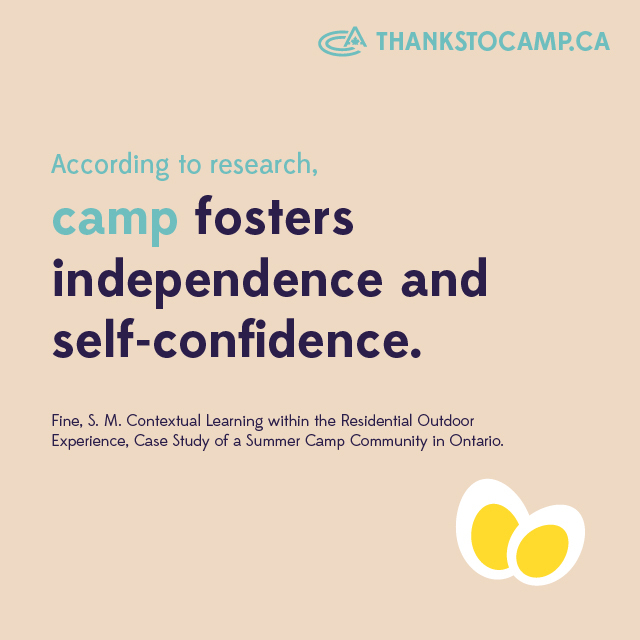 Research on the benefits of Camp was done and can be seen in these slides to show the practical learning that children experience at camp! They also put together “The Camp Song” by Peter Katz, shown below, where they asked campers, parents, alumni, and staff the question “Thanks to Camp…” to see how they were affected by Camp. We love children and teens. Period. Plain and simple. Our whole purpose, infused into and fueling the rest of our year-round events and activities, is to provide an amazing summer experience for them. 1. We focus on their world! Our programming, our supervision, our care and support of their needs works from an understanding of what it's like to be their age. Being age-appropriate means a world of creativity and fun is unlocked for them to enjoy as they would enjoy it. In this atmosphere they can be themselves most freely and honestly. This atmosphere results in growth and development that cannot be accomplished in many other structured environments which serve other good purposes for their lives. 2. We provide safety but also with challenge! Exposure to test their limits is what childhood is all about. Climbing a tree has the risk of scraping your knee - this type of attitude is embraced at Tulahead. Children are cared for but not shielded from normal activites of childhood that might result in them discovering something about themselves that an adult cannot teach them. Knowing their abilities, their likes, their dislikes and how to harness their own inner skills, abilities, attitudes, emotions to accomplish individual and team tasks. 3. We make things fun! All of our safety, supervision, and programming happens in anatmosphere where they explore and confront the challenges in fun ways that help to overcome the usual hurdles of motivation. Let's face it, in the adult world, work goes a lot better when you are with colleagues you are having fun with. Even more so in a child's world. When things are made to be fun and "crazy", the walls of defense and the social walls of fear and bullying can come down. Fun makes it safe to stand out, to risk and to laugh about things without it being malicious or hurtful. When kids can learn to do this, they don't feel the need to hide socially or to force their way through to acceptance. 4. We are here for you too, as parents and caregivers! We make it our goal to connect you and work together to meet your needs during camp week as well. From letting you know about things ahead of time, to working with you through the drop off, the unknown silence of the week, and then the reconnection and pick up, we are here for you. When situations arise that are out of the ordinary, you are viewed as our first resource for how to support your child, not the last. We will do our best to make sure your position is honoured even in your absence as we interact with each of the kids. This doesn't mean we can always do things your way, but it does mean that you are never out of the loop and your expertise with your child is always respected and sought out. Canadians from coast to coast came together to share the positive impact of camps. Check out Peter Katz's all new music video for "The Camp Song" highlighting these #thankstocamp stories, and to find out how you can join the movement, visit www.thankstocamp.ca --- Written and performed by: Peter Katz Peterkatz.com @peterkatzmusic Directed by: Émilie Trudeau Cinematography by: Gabrielle Raill Produced by: Raill Design inc.